The Northern Territory is mostly at the bottom of the heap of national education indicators, and the nation itself has slid downwards compared with other countries. The Gonski Report, the Review of Funding for Schooling commissioned by the Federal Government, makes dismal reading. For example, the Territory has the nation’s lowest proportion – just under 70% – of the 20 to 24 year-old population with Year 12 or equivalent attainment (2008). That’s for the non-indigenous population. 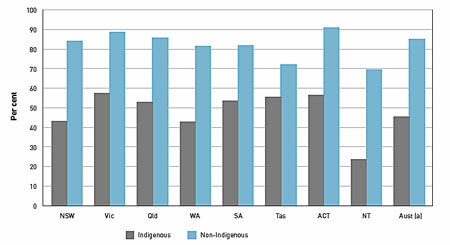 For the NT’s indigenous population the figure is 24%. The corresponding figure for the other states is at least double that (see graph). The fix advocated by the report is spending more money – at least an additional $5b – with only very general reference to other measures that could lead to improvements. True, the brief for the report was to focus on money, but does that make sense when there is much discussion about issues such as the role of parents in study results and – more basic still – school attendance. The report gives an “indicative estimate” for 2009 of the annual “schooling resource standard” of $8000 for primary school students and $10,500 for secondary. The report suggests disadvantages such as are hugely common in the Territory should be dealt with by funding loadings. The scheme, if implemented, would be a bonanza for some bush schools. • Size: 10% loading for medium-sized schools in remote locations and 100% for very small schools in very remote locations. • Low socioeconomic status (SES): 10% if less than one-tenth of students in the lowest SES group. 100% if more than 75% are in the lowest SES group. • Being indigenous: 40% for schools with between 5% and 25% indigenous students. 100% for more than 75% indigenous students. • English language: 15% to 25% for each student with limited English language proficiency. If all four categories apply, the cost per primary student, for example, could rise from $8000 to $30,000 – an investment still without results if parents don’t get their kids to school. The report limits itself to platitudes when discussing this: “Parental engagement (including carers and legal guardians) has a large and positive impact on children’s learning … parents and teachers should work in partnership to set high expectations and support children in their learning and development … parents should also be supported by the school to contribute to the school’s culture and operation. This works best when the parental engagement strategy is part of a whole-of-school approach, and teachers are offered professional learning on how to effectively engage with parents. But what if the parents don’t co-operate? The report is silent on that – and so is the NT Council of Government School Organisations (COGSO). It welcomes the call for an injection of $3.8billion dollars into public schools and for greater transparency and consistency to public schools funding. COGSO president Mark Brustolin says the report also “conveys that our schools need to forge connections with parents and the community, as key partners in children’s learning”. But he stops short of commenting on measures to deal with the reluctance of a significant number of parents to engage in such a process. Trouble is, it is and it isn’t about money. That is, the costs of getting teacher “bums on seats” to remote schools is at least 50% more than getting them to other areas but if you check out NT DET data you will see that remote schools have almost all teachers in the first few years of teaching and their average length of stay is very very short – rumoured to be at 8 months on average. A revolving door of novice teachers will never change things. FOI NT DET for the data and best of luck.